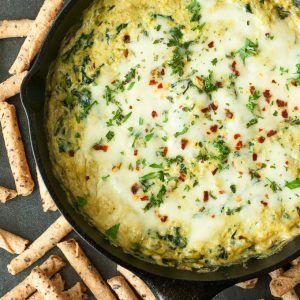 This easy cheesy asparagus spinach dip is ready to rock your next party or potluck! Trim and rinse your asparagus stalks, then blanch or steam until tender. In a food processor, combine asparagus, garlic, cream cheese, and parm cheese along with your garlic powder, onion powder, red pepper flakes, salt and paprika. Blend until creamy and smooth. In a well-seasoned cast iron skillet, sauté an entire package of spinach with a little bit of olive oil, then add your asparagus dip. Fold together and top with fresh mozzarella [or try gouda!] and bake for 15-20 minutes, or until hot and bubbly. Garnish with your favorites [parsley, part, red pepper flakes, etc...] and grab your favorite dippers! Recipe yields 3 cups of dreamy dip.